Remove the meat from the pork sausages, add about ¼ cup of breadcrumbs to the sausage meat and combine well. Divide into 6 equal portions. Place about a cup of breadcrumbs onto a plate. Peel the eggs and cover with sausage meat, it should be about 1 to ½ cm thick. Then simply roll in the breadcrumbs to give them an even covering of breadcrumbs. Tip: If the sausage meat sticks to your hands, just dip you hands into cold water and shake them off. 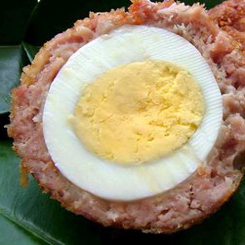 Place a pan with about 2cm of oil on a medium heat and cook the scotch eggs until they are golden brown. Remove and set onto some kitchen paper to drain. That’s it, your scotch eggs are done. You should never need any salt or pepper because the sausage meat is already spiced, but what you can do is add finely chopped parsley or sage to the mixture just to give them a little something extra. You could also add some chili flakes if you like a little heat. Here is a quick sausage recipe for sausage fans.